You, my friend, are a warrior. You will defend your clan. You will fight for your child to survive. No matter how “non-maternal” you were before, suddenly, when you hold that little bundle in your arms, something profound happens. You have some innate abilities and instincts that are worth trusting. Although you’re going to have not-so-stellar parenting days, just showing up on the battlefield is worth a few shield-claps. Some warrior skills can only be attained through study and practice. Your baby provides all the practice. This article is a part of that “study”. 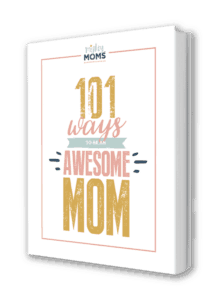 It’s a chapter in what I’m calling the Mighty Mom’s Secret Handbook. Oh, and when I said “everything” in the title, I mean EVERYTHING. Remember the last time you flew, and the flight attendant did her little spiel at the beginning, pointing out the exits, talking about floating devices, and sending nervous flyers into panic attacks? Think back, now, about how she explained the oxygen masks. Adults should put the masks on themselves FIRST, before putting it on their children. At first glance, it seems like a pretty selfish statement…but once you think about it, it makes a lot of sense. If something changes and the oxygen level drops, your child isn’t going to be able to help you get to the oxygen. You need to secure the mask on yourself, so you can better help those who are dependent on you. Identify your mothering style, and then use what you learn to identify what your personal needs look like. Take our free Mamanalysis to uncover your strengths and then play to them. Allow yourself a few mommy breaks to come up for air and catch your breath. Look down the road and schedule some time away with your husband. Whether it’s just dinner and movie, or a full-blown escape, take time to pour into your most important relationship. Remember, self-care has to be balanced with baby care. Just as you can spend too much on your baby and neglect yourself, history shows us there’s a ditch on the other side as well! Be careful not to neglect your baby in obsessive narcissism. Aim to stay in the middle of the “needs” road! The most important thing you need to do is feed your baby. No feedings means no growth (and other social work unpleasantness). If this is the goal, then it makes sense that you’re going to have to decide how, exactly, you’re going to meet it. People are going to judge you if you formula-feed your baby. People are going to judge you if you breastfeed your baby. Seriously, you can’t win on this issue. So decide, right now, not to care. “People” are not going to decide your value as a mother. If you let them, friend, they will destroy you. “People” are the worst. So consider the merits of both feeding techniques, take this little quiz, read through the benefits of each below, and then decide for yourself. It’s amazing feeling to nourish your child with your body. Yes, there’s a learning curve, but once you and your baby hit the groove, it’s an indescribable bond. It’s a nutritional power-house for your baby. Although Similac’s new formula gets closer, nothing can fully replicate the nutritional punch that breastmilk provides. It’s good for your body too. It lowers your risk for osteoporosis and breast cancer later in life. It’s a calorie burner. Obviously, you should rely only on breastfeeding to reduce your baby weight, but it’s a nice little bonus! It speeds up your postpartum recovery. Breastfeeding sends out hormonal messages that help the uterus contract faster and help you feel “back to normal” sooner! I strongly encourage all moms to give breastfeeding a try, since all these benefits help you and your baby even if you only breastfeed for a short period of time! Also, if you decide to give it up, you can always switch to formula…but if you start with formula, you can’t switch back. So why not give it a shot and see how it goes? Did I miss a breastfeeding benefit that you think is really important? Share it in the comments so I can add it to the article! Despite what you may have heard…there are mothers out there who actually choose not to breastfeed. They select to choose an infant formula straight from the get-go. You know what? That’s okay! I used formula with my three girls (as well as breastfeeding), and they are smart, clever (perhaps too clever…), and on their way to become 100% functioning members of society. Let me tell you, sister, your child’s future success in life isn’t tied to your feeding choice. Unfortunately, life just isn’t that black and white. Here are a few reasons why some moms have chosen NOT to breastfeed. Breastfeeding is a skill, and not all babies are easy to breastfeed. For some mothers, the emotional struggle isn’t worth it. It’s really really hard to breastfeed multiples. It’s doable, absolutely, but some moms prefer to share the feeding duties right out of the gate by using formula instead. It’s sometimes not possible to breastfeed for medical reasons: perhaps a previous surgery, or current medications babies can’t ingest. If a child is really struggling to gain weight and thrive, parents may choose formula because it’s easier to track exactly how much is being consumed. Going back into the workplace is stressful enough…let alone bringing the breastpump into it. Or, if you prefer to use organic formulas, the absolute-purest organic formulas are going to be European ones. I’ve never met anyone who didn’t love these formulas! When you start using your formula, keep a journal to track when you fed your baby, how much he ate, and how he “seemed” afterwards. Did he spit up a lot? Did she seem gassy? Here are the 11 signs of a formula allergy you’ll want to watch for. Did you choose to use formula? What guided you to that decision? Share it in the comments to help other moms! Sometime between 5 and 7 months, your doctor is going to give you the thumbs up for solid foods. You just mastered the bottle! Now all the sudden you have to deal with bibs and high chairs, and making foods choke-proof! The first thing I recommend doing is picking up a copy of What to Feed Your Baby. It’s a short, inexpensive booklet, beautiful enough to print and keep on the kitchen counter. Most importantly, though, it walks through all your favorite fruits and veggies, letting you know when it’s safe for your bubster to try them! Don’t feel pinned to one particular method, either! There’s definitely room to move between all three, whatever is most convenient for you! See how easy that was? You are now providing your baby with the sweet nourishment she needs to thrive. I guess that begs the question…how do you know she’s thriving? And what happens if she STOPS thriving and…*gulp* …gets sick? Obviously, you’re not going to become an expert on all babies. The goal here is to become an expert on your baby. As you spend more and more time with him, you begin to figure out his “tells” and baby cues that he uses to try to communicate what he needs. You can identify when he seems “normal” and when he seems, well, off. Given a little time, you’re going to know this little person better than anyone else on the planet. This makes you not only an expert on your child, but gives you the unique ability to be his strong medical advocate. Of course, you’ll have to be able to know when you need to put those advocacy skills to good use! Let’s go over the best ways to monitor your baby’s health. Other than tracking how much your baby is eating, the 2nd most accurate way of determining your baby’s health is to track her measurements and milestones. You can help keep a close eye on your baby’s measurements by tracking your child’s weight and height at home using a Baby Growth Chart. There is one included in the Milestone Marker Growth Tracker that teaches you how to plot your child’s growth within just a minute or two. The Growth Tracker also shares the weight and height gains your doctor is going to hope to see, so you can catch any “failure to thrive” issues right away. The doctor is also going to be tracking your baby’s milestones. Is he rolling over with the other babies his age? Is she starting to babble at appropriate times? This give important clues about the brain’s development. The sooner doctors identify possible developmental issues (like autism) the more effective the treatments are in overcoming them. The Milestone Marker Memory Tracker not only shares when to watch for the standard milestones (rolling, crawling, walking), it also gives you the fun bonuses like “First laugh” or “throw a ball”. Even better, each milestone includes an activity for you to help him practice and space for you to write down the memory that goes with! Perhaps most importantly, the Memory Tracker includes a section called How to Spot a Delay that clearly lays out when you need to notify your doctor about a possible developmental issue. It’s beautifully designed and makes a cherished keepsake for years later! The Milestone Marker is the best downloadable health tracker out there, but we all know that “health” is more than just growing stats. At one point, your baby is going to get the sniffles. Her nose is going to get crusty, she’s going to offer up sad little coughs and your heart will break because she looks just so miserable. What do you do then? This is when the true parental panic comes out. After all, some of the things your mom did for you may not be wise for littles! Not to worry, friend. Mighty Moms has got you covered. *wink* Familiarize yourself with these articles now, so you can stock up and have all the medical baby care equipment you need when the first little bug shows up. It’s very common for you to think your baby has a cold or an ear infection, but it really just ends up being teething. They have some of the same symptoms, actually. Some kids are Champion Teethers, and you won’t know they’re teething until you actually see a tooth! Other babies…not so much. In those cases…brace yourself. Monstrous Mr. Hyde is about to move into your baby’s crib. Learn how to spot the typical signs of teething, then perhaps browse over the stranger signs of teething (like the Vampire Syndrome) so you can get a fairly good idea on what you’re looking for (besides a TOOTH, of course). Once you’ve decided that it really is teething, it’s going to be tremendously helpful to have a teething pain remedy plan in place. After all, 95% of the time your baby’s teething pain is going to be the strongest at night….as if sleeping wasn’t already a challenge! After you’ve figured out the first thing you’re going to do, create a back-up plan for that, and then a back-up plan for your back-up plan. Remember, the more options you have to try, the more likely something is going to work and help you all get a few hours sleep! Phew! You’ve made it past the 2nd baby care skill challenge! You’ve learned how to monitor your baby’s overall growth, and am now armed with the knowledge you need to tackle everything from nasty colds to terrible teeth! It’s time to tackle the final Warrior Mama Baby Care Challenge: SLEEP. The bad news is that sleep deprivation is part of being a new parent. Newborns just aren’t big enough to sleep without needing to be fed. The good news is that once you understand what your baby can and cannot do, you can really work on the CAN DO’s and make a huge difference in the quality of everyone’s snoozes. I would strongly encourage you to download my free Sleep Needs Printable. It lays out exactly what you can expect your child to need, sleep-wise from birth to 4 years old. Perhaps the most helpful tool on this free sleeping printable is the “Waketime Window”. This tells you approximately how much time you have between when your baby wakes up, and when he’s likely to get overtired. It’s like looking at a ticking time bomb…you have approximately one hour to get those eyes closed and snoozing before Captain Overstimulation swoops in and makes the rest of your day/night a living hell. If your baby is considered “highly alert” or “sensitive,” this document is your saving grace. Those personality types have a very quick leap between “okay” and “out-of-mind-tired”. Those babies aren’t going to give you 10 minutes of yawning to watch for. They are going to be happy and playful one second, then rubbing their eyes and screaming their heads off the next. An overtired baby is going to struggle to stay asleep at night. An overtired baby may even wake up earlier in the morning (before 6am). I know this seems counter-intuitive, but years of study and coaching clients have shown it’s true! Why is there no schedule for a 4-5 month old? Because there’s a HUGE growth spurt around that time that messes everything up. It’s such a difficult time, that I don’t feel I can create an “average” routine to show you! It’s between this 20-22 week period that you will notice your newborn has disappeared and a fully-fledged baby has taken his place! That much change will often create sleep regressions that can be difficult to get through. If this is your situation, sit down with us for a one-on-one Sleep Session and we can help you create a plan to not only get past this time, but have coaching tools ready to go when the time is right! It’s true. You don’t have to choose between Cry-It-Out (CIO) and nothing. There are other GENTLE methods we can use to help your baby learn how to fall asleep on his own and stay that way all night long! Why should you listen to anything Amy and I have to say in regards to your baby’s sleep? We’ve invested thousands of dollars into getting a thorough education on childhood sleep and positive behavioral modification techniques. We’ve been tutored by doctors, therapists, lactation consultants, and other experts on how to spot “warning signs” that let us know that there may be a medical reason for the wakeups so we can refer you back to your doctor for a checkup. We’ve taken tests and passed through a period of supervision by The Sleep Lady herself, Kim West. I’ve been certified (yes, that’s a thing that weeds out the professionals from the hobbyists) since 2014. My colleague Amy achieved her certification in 2016. You can learn more about what makes us different from other sleep coaches by clicking here. Using positive gentle techniques is how we’ve helped hundreds of parents achieve Full Snooze Status through our Sleep Sessions or with our Full Gentle Sleep Coaching Packages. Okay! So you’ve got a good idea on how to start working on improving those sleeping skills, either by seeking to find your baby’s natural rhythm, catching his sleep window, or avoiding these common sleep coaching mistakes. What, exactly, is the Warrior Mama Code that you’re sanity needs you to pledge to? Listen closely, sister. You are taking care of a TINY HUMAN that is 150% dependent upon you and your spouse. This is your life’s mission right now. Everything else is secondary. Allow yourself to become a hermit. Let the laundry sit in piles for a while longer. Pick one or two close friends, and make them your “social circle” for a few months. In other words, set LOW expectations for yourself. Lower than you think you need. You’ll thank me for this later, promise. Do not, IN ANY CIRCUMSTANCES compare your mothering or your baby to someone else. The quickest way to feel like a failure is to look at that mother across the hall and wonder why your life can look that easy. You don’t know anything about that woman’s life. She might be struggling with postpartum anxiety. She may be incredibly lonely. In all honesty, she may be thinking the same thing about YOU as you are about her! The key is to remember that no one (NO ONE) is perfect, and to have a good sense of humor! Sharing your mom blunder is a great way to connect and build bridges with other struggling mothers! You know what motherhood doesn’t mean? It does mean, however, that you’re in for a wild, wonderful, chaotic ride. So take any motion of “balance” and chuck it out the window right now, before you drown in false expectations. Be patient with yourself, be patient with your baby, and be patient with your spouse. Your life has just undergone a MASSIVE shift, and it’s going to take everyone time to adjust. Baby included. Oh, and by the way, if you had a difficult delivery and have struggled with those “warm fuzzy feelings” towards your baby, don’t feel ashamed. That’s okay. Give yourself time. Keep showing up to check off the motherhood boxes (feeding, sleeping, etc.) and, I promise you, those strong bonding feelings will follow. You made it! All the way done to word 3,967. Exactly what it required to fulfill my promise of everything you need for confident baby care. And YOU – you stuck with me to the very end! That makes you, by far, my favorite reader. Now head out there, Mama Warrior! Pick up that babe of yours, kiss those cheeks, and move confidently ahead.